In 1939, German doll-sculptor Kathe Kruse made the first formulation of what would eventually become known as the polymer clay brand Fimo, and gave it to her young daughter, nicknamed Fifi, as a modelling material. Years later in the 1960s, the formulation was sold to Eberhardt Faber. At the same time, other companies were experimenting with polymer-based materials, including American firm Polyform, who initially intended their Sculpey brand to have industrial applications. When the product was deemed unfit for its original purpose it was shelved until someone saw its potential as a modelling compound. In the beginning, polymer clay was marketed heavily as a toy, its rainbow colours and ease of use making it a popular craft material for children. Yet from these humble beginnings, polymer clay has very quickly progressed into a varied and rich art form, thanks to those pioneering artists who first saw its hidden promise and began to experiment. It may not have the centuries of history and tradition that glass, ceramics and fine art have accumulated, but nonetheless, over a period of less than a century, artists and crafters working with polymer clay had explored a wide range of possibilities, encompassing and modifying techniques from other media as well as discovering innovative methods that were particularly suited to the properties of polymer clay. Some of these ground-breakers include Nan Roche, whose book The New Clay is widely regarded as the original polymer clay bible, Marie Segal, who helped Polyform create the first line of clay in the traditional artists’ colour palette, namely the Premo! brand. Also Donna Kato, whose demonstrations of polymer clay crafting on television introduced it to a new audience, and Judith Skinner, discoverer of a foolproof and easy method for making gradient colour sheets, ever after known as the Skinner Blend in her honour. In recent years, polymer clay work has begun to be accepted as a legitimate art form, with prominent artist Elise Canning organizing gallery exhibitions showcasing the best of polymer clay artistry; the Racine Art Museum holds an extensive collection of fine art polymer clay, as do several other museums and galleries across America; finally, polymer clay is starting to evolve past the stigma of its beginnings! Modern day polymer clay is a synthetic plastic made up mostly of polyvinyl chloride and various pigments; many polymer clay brands also carry lines of clay that have special properties, such as inclusions of shimmering powders, transparency, and glow-in-the-dark effects. In its raw state it is a soft, malleable material that can be sculpted and manipulated in a variety of ways, and when set in an ordinary oven it becomes firm and stable. Currently, the main brands of clay comprise Premo, Sculpey, Kato Clay, Fimo Classic and Soft, Viva Decor Pardo, and Cernit. It’s not difficult to see why artists of all types, including sculptors and traditional painters gravitated towards polymer clay. It is available in a wide range of colours, with the potential for further colour mixing by the artist. It can be worked like ceramics, and yet unlike earthen clay, raw polymer clay has a lengthy open time; in effect, an unfinished piece can be manipulated and even left over long periods of time and returned to later without any difficulties, as long as the clay is kept cool and dry. A further benefit of polymer clay is the low cost of starting up. Although there are many advanced tools available for the avid clayer, professional results can be achieved with just a few packets of clay, some old household objects, and practice, and the finished work can be safely cured in a domestic oven. (Curing refers to the process of baking clay at the recommended low temperature, often around 100 degree centigrade, to remove the active plasticizers in raw clay, and transform it into its baked, solid state). Many clayers find a pasta machine to be an invaluable tool for conditioning clay and rolling smooth, even sheets, although a acrylic roller or brayer can also serve the same purpose; simply tape two lolly sticks, or two stacks of playing cards parallel to each other on your work surface, and roll the clay out between them, resting your roller on these guides as you roll, for a sheet of consistent thickness. If you are interested in jewellery making, you will probably be most interested in using polymer clay to make beads and other components. Very simple beads can be made by twisting and rolling two colours of clay together to get a marbled clay, and forming this into your desired bead shape. To make the bead hole, piercing with a cocktail stick or thin knitting needle works well, or you can drill the bead holes following curing, which will ensure you don‘t distort your bead shape. In order to bake the beads, it is a good idea to thread them onto a length of wire or onto cocktail sticks and suspend them over a baking tray, or alternatively, you can accordion fold a piece of card and suspend the beads over this. Beads and other objects can also be rested on a bed of corn starch, which is easily dusted away following baking. 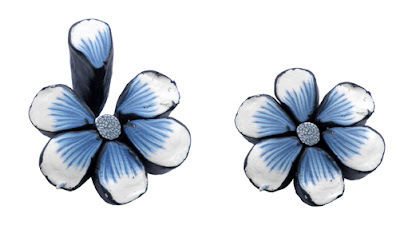 One popular way to embellish polymer clay beads is the art of millefiori, or caning. Taking its inspiration from the glass-working method of the same name, polymer clay caning involves building an image or motif in cross-section and then stretching or manipulating the length of clay to a smaller diameter. When the length of clay, or cane is cut into, the original image can be seen running through it in miniature, in much the same way a word or picture runs through a stick of seaside rock. Pieces of the cane can be thickly sliced and baked as is to make charms, or thin slices can be shaved away and applied over a base bead to build up a decorative pattern. Another widespread technique involves stamping or impressing raw clay with different textures to create an interesting effect. Anything that will not be ruined by contact with polymer clay can be used as a texture, including old pieces of fabric, sandpaper, wooden objects and metal implements. Plastics can also be used in this way, although be careful about leaving plastic objects in prolonged contact with raw clay as certain types can react with the plasticizers and cause a messy chemical reaction. Tools from other crafts and arts may also be used to great effect, including stamps, carved linoleum blocks, stencils and embossing folders. Various surface materials can be combined with stamping and texturing for further embellishments. There are several brands of paints and inks that can be applied to raw or baked pieces, allowing you to stamp or draw an image onto your clay canvas. 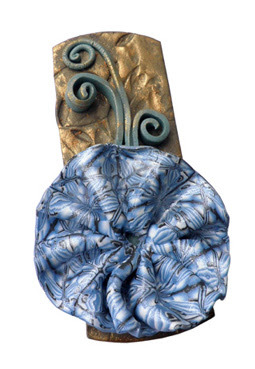 Metal leaf may also be adhered to raw clay, and a variety of colourful foils are available for use with polymer clay. A complex surface effect can be achieved by transferring a piece of metal leaf or foil to a sheet of raw clay and running it through a pasta machine to produce a crackled effect. You can also apply a light wash of inks onto this crackled sheet for extra colour and depth. Glitters and powders, including crumbled chalks, are an easy way to add instant sparkle and colour to polymer clay as well. Simply brush onto the clay before curing, or use a clay-compatible varnish to adhere the glitter to a previously baked piece. A particularly effective product is mica powder, a very finely ground organic mineral that when brushed onto clay provides a beautiful shimmer, and which can be used to highlight raised or depressed areas in your work. However, whilst there are many products available that are perfectly compatible with polymer clay, it is wise to make sure that what you are using will not react with the clay, either by checking with other artists, or by performing a test on a scrap piece of clay. Certain varnishes and paints, for example, will either fail to dry properly on raw clay, or worse, chemically react over a period of time; even if something appears dry, it may start to turn tacky up to two years later or more! After making and curing your polymer clay beads, you may find there are small surface imperfections or fingerprints on them (although sometimes fingerprints can add a certain charm to handmade items!). To achieve a smooth finish and remove these marks, it is a good idea to wet-sand your beads with sandpapers, starting with a low grit (I.e. a courser grade sand paper) and working up through progressively higher grits until you get the look you want. You can then coat the beads with a compatible glaze or varnish for a high shine, or buff the beads with a rough cloth or piece of denim for a more subtle sheen. Take note, however, that if you have used metal leaf, foil or other embellishments on the top layer of your beads, sanding will remove most of your work, so try to ensure your beads are as smooth as possible before curing in this case, and protect the embellishments with a coat of varnish afterwards. Learning to create polymer clay beads is a fun and satisfying addition to your jewellery skills, but there are also many advantages to using polymer clay components in jewellery pieces. Like paper beads they are a lighter alternative to glass and gemstones, you can incorporate larger beads and a greater number without adding an excessive amount of weight, making the piece more comfortable to wear. Even lighter beads can be made by using a foil armature inside a veneer of clay. The almost unlimited potential for colour mixing also means that a colour swatch can be readily matched, allowing you to create a coordinating and complementary colour scheme with ease. Using a combination of the techniques described above, nearly any pattern can be replicated too, including the organic patterns and textures of gemstones, woods and stone; it is no wonder polymer clay been nicknamed the chameleon clay. Many eyes have been fooled by polymer clay’s talent for mimicry! Whilst polymer clay is certified non-toxic, there are certain precautions you must take to ensure your safety. At the correct temperature, polymer clay will cure safely inside your domestic oven, but if taken too far above that temperature the clay will burn, and produce unpleasant fumes. If this happens move the burnt clay outside, and make sure any animals are kept well away, especially birds, who can be particularly susceptible to chemical fumes. If you are at all concerned about using your home oven for curing polymer clay, you can place your pieces in a oven-safe bowl and create a ‘tent’ out of cooking foil to contain any odours. In addition, any household or kitchen tools which have been used for polymer clay should not be used for food preparation or use afterwards; make sure you collect a separate set of tools for your polymer clay, and cure your creations on a dedicated baking tray or bowl. Similarly, polymer clay cannot be applied to or used to decorate anything that will have direct contact with food or drink. Glass Attic – a wealth of polymer clay information collected over the years.